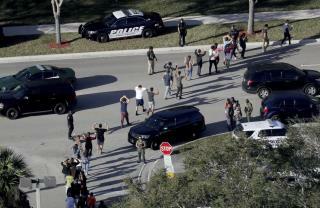 (Newser) – For Russia-linked Twitter accounts and bots linked to Russian propaganda campaigns, last week's horrific school shooting in Florida was just another opportunity to sow division among Americans, security researchers say. Within an hour of the shooting, hundreds of automated Twitter accounts with suspected Russian links began sending out tweets with hashtags like #NRA and #guncontrolnow, seeking to spread what analysts call "divisive propaganda" on both sides of the issue, the New York Times reports. "This is pretty typical for them, to hop on breaking news like this," says Jonathon Morgan at New Knowledge, a firm that tries to track disinformation campaigns. "The bots focus on anything that is divisive for Americans. Almost systematically." American conservatives love lying commie trolls almost as much as they love a lying, vain, tax-cheating, draft-dodging, perverted, fake tanned, fake President. Worse, Trump and his supporters share a deep, abiding, enduring love for Vladdie Putin, the ex-KGB murderer. The ONLY reason that conservatives are angry is their commie BotBuddies are being outed faster than their CPAC money can be funneled to Moscow to create MORE commie BotBuddies. Because ... those angry, fake-news-creating conservative goons are soooooo patriotic. Reagan will turning in his grave listening to all these Republicans defending Russia.